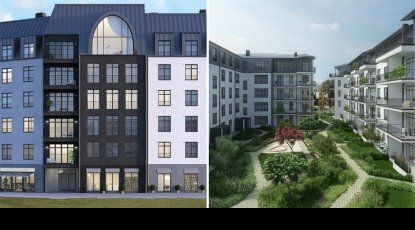 The contract was signed between Latvian building firm Merks – part of the Estonia-based Merko Ehitus group – and Vastint Latvia, to construct a new six-floor, 19,000 square-meter multifunctional building at Antonijas Street 17a. Known as Magdelen, it includes two apartment buildings, connected through a common first floor, a parking area and commercial premises on the first floor and 123 fully finished apartments on the upper floors. There’ll be a green garden on the roof. The expected value of the contract is €11.4 million, plus VAT, and the work is due to be completed in July 2016.